With the rise of IKEA and other big­box furniture stores, a modern design aesthetic has become very prevalent in interior design circles. Minimalism, lots of solid colors, and/or a simplicity of trim styles seem to dominate hotel rooms and trendy decoration. A lot of emphasis in the TV lift furniture field is put on blending cabinet designs with existing décor or old­ fashioned aesthetic. Sometimes customers think that these are the only options available. Sure, many selling points for TV lift cabinets come from how flawlessly they can be made to blend into an existing design, but this doesn’t necessarily mean that the designs must be old ­fashioned and boring! Many people have a modern design aesthetic that they would like to maintain for all of their furniture, not just their tables and chairs. Fortunately, we are well ­aware of the difference in taste and aesthetic amongst our customer base. TVLiftcabinet.com offers designs as diverse as a brown Swedish leather upholstered cabinet or the Carlton TV lift cabinet, designed to look like an old ­fashioned shipping trunk. For the particularly out ­there or unique design style, we can even offer custom designed TV lift cabinets to fit any décor or aesthetic. You can even choose the wood and finish. Our TV lift cabinet designers will send you a color sample for your approval, and before we build it, you will see a color ­rendered example so you know exactly what you’re getting. 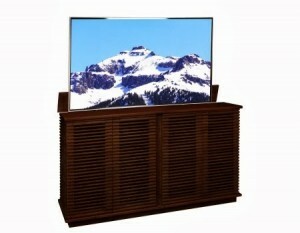 In addition to the wide array of sizes, colors, and designs, each TV lift cabinet is fully functional and offers the features that TVLiftcabinet.com are famous for: free white glove delivery, built in IR receivers to make using A/V remotes a breeze, and best of all, no assembly required. You can always save 50% on TV lifts by buying direct from our website.